Although other kinds of employers within business are tracked, such as publishing, management consulting, and entertainment/sports management, it remains the case that about half of the jobs in business and industry are with "other" kinds of employers not specifically tracked. This encompasses a wide range of businesses, such as all manner of positions in retail, manufacturing, healthcare, and pharmaceuticals, to name but a few kinds of employers. 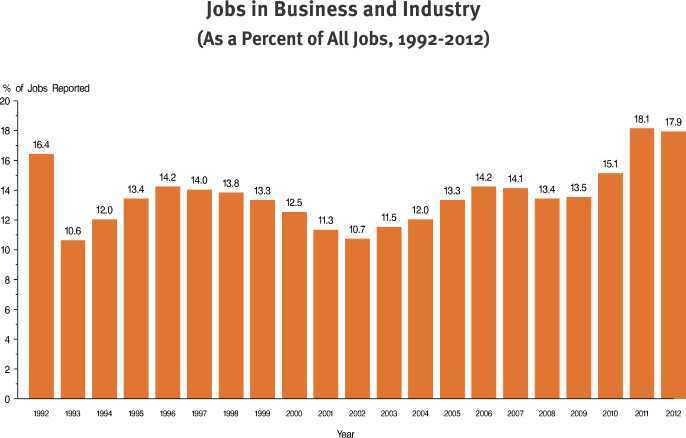 Finally, the growth of business jobs that are categorized as JD Advantage (JD Preferred prior to 2011) is evident. The percentage of jobs for which bar passage is required has drifted up and down. Prior to 2001, jobs were classified as legal, other professional, and nonprofessional, so direct comparisons with 2001 and later years are not possible. 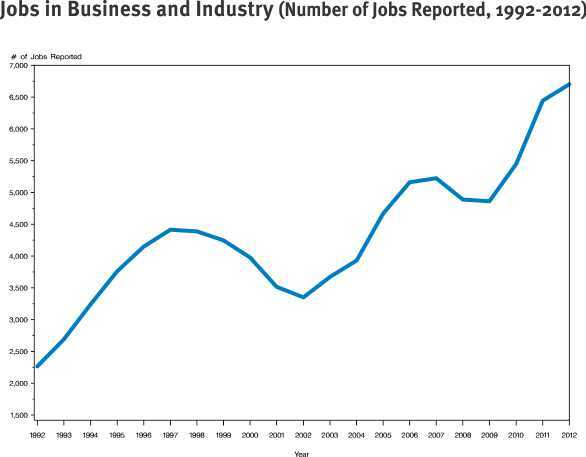 During the 1992-2000 time period, about 40% of business jobs were reported as legal. It is likely that some portion of these jobs were closer to the JD Advantage categorization than to jobs for which bar passage in addition to a JD degree were required. Note: All information above based on NALP’s Employment Report and Salary Surveys for 1992-2012.